We know that quilters come to the Paducah Quilt Show and they are prepared for their classes, and they have good walking shoes for walking through the show and around the city. But this year one quilter came prepared for any and all flood waters he might encounter: Wallace Murray, quilter from Prior Lake, MN, had his snorkle and flippers at the ready in case he needed them. 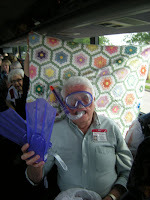 Wallace, we are certainly glad that you didn’t need to use your underwater equipment, and that you enjoyed the show!